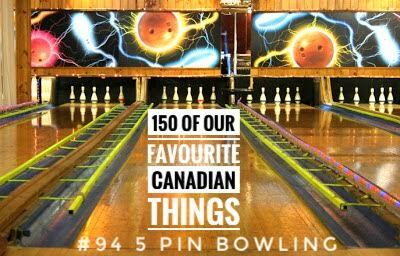 If you’ve ever bowled in Canada you are probably used to seeing a few of the lanes only having 5 pins and using smaller balls with no finger holes. That’s because 5 pin bowling is unique to Canada. The game was created in 1909 by Thomas F. Ryan after many of his customers complained that 10 pin bowling was too strenuous. Since then most bowling alleys in Canada have dedicated 5 pin lanes. In traditional 10 pin bowling, each pin is worth a single point and knocking all of them over yields 10 points but with 5 pin bowling, each pin has a different value (the furthest two are worth 2 points, the middle two are worth 3 points and the center pin is worth 5 points) and knocking them all over yields 15 points. Another difference is in 10 pin you have only two chances to knock down all the pins whereas with 5 pin you have three chances. Truthfully though, as an adult, 5 pin isn’t much fun. It is definitely geared for the younger crowd who would have trouble with 10 pin and the elderly who still want to be active on the lanes. I have fond memories growing up and having birthday parties on the 5 pin lanes, and somewhere out there is embarrassing videos of said parties, so the game will always have a special place in my heart.